Whew! What a week! Not only did I have my first week on the Samsung payroll, I also moved into a new residence. While I catch my breath I'll recount how things went. First, I returned to full-time workforce after a 28-month hiatus on Monday, ironically celebrated as "Labor Day" in my home country. I slapped the alarm clock, suited up, wolfed down breakfast, and arrived at 7:50AM at the office. It was like a return to first year of business school, albeit dressier. Our first two weeks at Samsung are an orientation period, so we're not "working" per se, though keeping similar hours. Thankfully we had been up early the week before to attend Korean language classes, so it wasn't a complete jolt to the system to be up that early, though certainly the realization that I no longer live in B-school la-la land has set in. 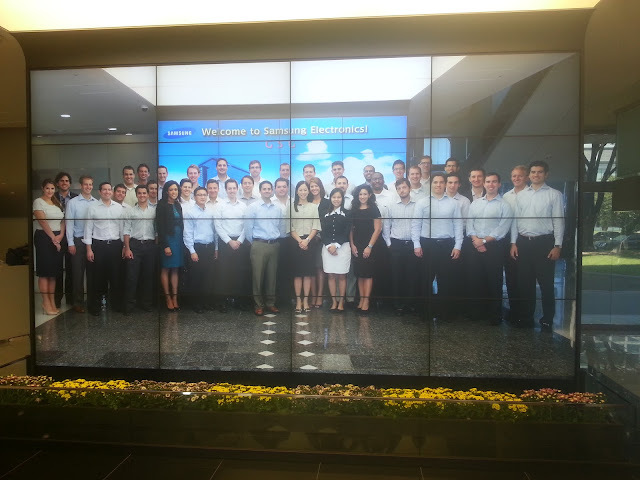 On Monday morning, the 42 new hires boarded a bus in Seoul and traveled to the Samsung HR Development Center (HRDC) in the exurbs of the Seoul metro area. The HRDC was quite nice and immense...even had dormitories for overnight stays. Felt like "Camp Samsung" to me. Our group stayed for two days, spending the night sleeping on the "Wassily Kandinsky" floor (meant to inspire our creativity we were told). 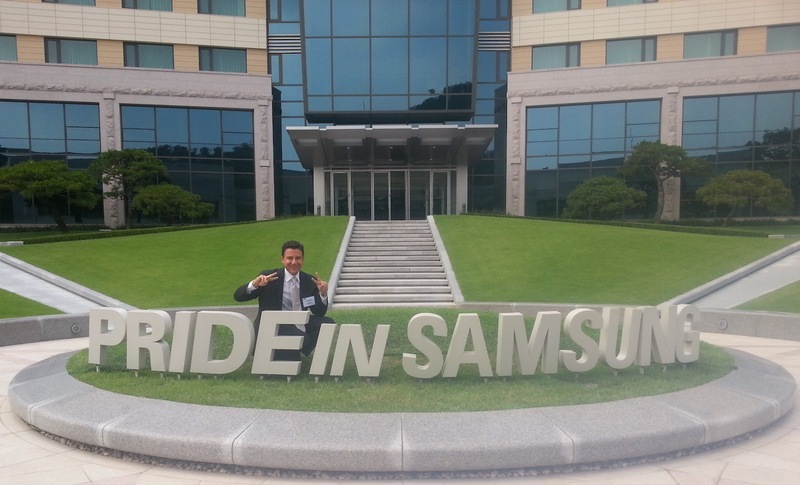 At the HRDC we listened to lectures on the Korean culture and succeeding at Samsung. Wednesday felt less like work as we completed a "challenge course" designed to promote teamwork. No trust falls at Samsung, though we did climb ladders built from logs and learned how to communicate with one another while blindfolded. On Thursday, we toured Samsung Electronics facilities in the nearby city of Suwon, listening to more introductory lectures and viewing the assembly of semiconductors. On Friday, we stayed in the new office in Seoul and learned about some of Samsung's lesser-known business divisions: construction, green energy, and insurance. The weekend left no time for rest as my moving day was Saturday. It felt disorienting to be leaving my hotel in Gangnam – after a month there that neighborhood had become the center of my Korean universe. My new apartment is in Hannam-dong, a neighborhood just north of the Han River that has many of Seoul's foreign embassies. I seem to be in the ASEAN area – the embassies of Laos, Cambodia, Myanmar, and Thailand all stand within two blocks of me. The neighborhood feels far more residential than Gangnam and is popular with colleagues in my group due to its proximity to the bustling Itaewon nightlife as well as the office (a 25-minute commute by bus). The moving company arrived promptly Saturday morning at 9AM and got to work very quickly. So much more manpower on the Korean side of the move – I had three Americans packing my stuff in Charlottesville, and eight Koreans packed into my apartment to unload! Not surprisingly, the Koreans worked very quickly and I frantically tried to direct them. After living out of suitcases for almost three months, I started to wonder why I owned so much stuff! Thankfully almost everything arrived intact. The new apartment has a lot of space and a lot of windows. I also have a guest bedroom, so any visitors to Seoul have a place to stay! After living like a vagabond since school graduation, it feels great to finally have a place to finally settle into. There's a lot more to be done to make Seoul feel more like home, but having a full-time residence is a milestone. Getting the new guest bedroom set up. Open for visitors!